MORE than £17 billion will be spent on decommissioning North Sea oil platforms over the next decade, according to a report. Between the UK and Norwegian continental shelves more than 100 platforms will be completely or partially removed, with around 1,800 wells scheduled to be plugged and 7,500km of pipeline forecast to be decommissioned, Oil & Gas UK said. Growth in the decommissioning industry has been welcomed along with calls to develop a bigger decommissioning capacity to “make the most of the opportunity”. Decommissioning Insight 2016, published by Oil & Gas UK, said the market was worth more than £2 billion last year. The total amount forecast to be spent on decommissioning on the UK Continental Shelf (UKCS) between now and 2025 is £17.6 billion, up from £16.9 billion for the 2015-24 forecast. The Scottish Government believes there are “very real economic benefits” to come from decommissioning. Mike Tholen, Oil & Gas UK’s upstream policy director, said: “Of the estimated £17.6 billion of decommissioning expenditure on the UKCS over the next 10 years, more than 50% of this market will be found in the central North Sea. Despite the expected growth, the report warns against “premature decommissioning”, with up to 20 billion barrels of oil and gas still said to be recoverable from the North Sea. Mr Tholen added: “If the UK is to continue to gain the full economic benefit from its oil and gas resource, it is important that the industry continues to work with the Oil and Gas Authority as well as with HM Treasury to attract fresh investment, avoid premature decommissioning, retain the critical infrastructure needed to access future reserves and ensure decommissioning is carried out in a timely and most cost-effective way. Scotland’s Energy Minister Paul Wheelhouse said: “We agree with Oil and Gas UK that there are very real economic benefits for Scotland to come from decommissioning and we are well placed to capitalise on them - indeed we believe Scottish suppliers are already well established in areas of decommissioning, such as high value well plugging and abandonment activity. “I will be in the north east later this month to focus on the opportunities of decommissioning and to follow up on the commitments the First Minister set out in our Programme for Government. 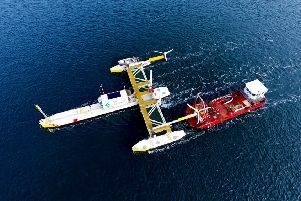 “Decommissioning is just one of the opportunities along with opportunities arising to the sector’s expertise and capabilities in innovation to ever more efficiently recover the substantial oil and gas resources remaining in the North Sea, and to harness transferable skills to develop offshore renewables - all of which have the potential to deliver enormous economic benefits for the whole country.